RRPS Slim Line Admin Pouch comes off looking pretty simple, but packs quite an organizer punch for its size. 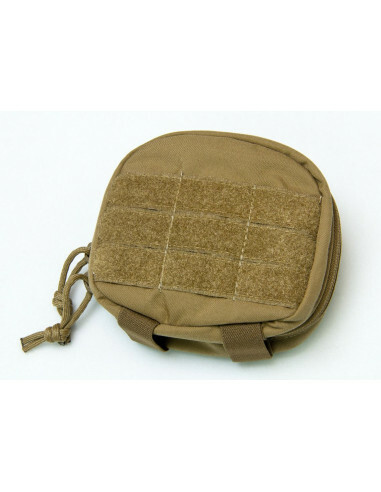 The exterior sports PALS webbing with loop so can use both patch IDs or stash items in the webbing. On the bottom is elastic webbing a great size for a tourniquet, however can hold many similar sized items. The inside opens up with dual zippers clamshell style with the frontal side having a mesh pocket with hook and loop closure and then on the back side a sleeve pocket with 3 elastic divisions on top. The layout accommades a medical loadout well, but many will find all kinds of EDC uses for it. There is enough hook so the pouch stays in place when wanted, yet can easily be torn out when desired. Made in the USA by Tactical Tailor.